They have some experience investing in pensions, but they're not what you'd call 'savvy' investors — and they certainly don't want to make investment decisions themselves. So, they did the grown-up thing: they went to see a financial adviser. Financial adviser Tony Turner listened intently to the Miggins, conducted a detailed fact find, risk profiling questionnaire and a capacity for destruction (loss) assessment. He’s a stickler for all things regulation, so he made sure that the boxes were ticked for MiFID-this and PROD-that and all the other soul-destroying regulatory boxes advisers must tick. In the end, he recommends that the Miggins buy a joint-life index-linked annuity to provide an income of £6000, before taxes. This, together with their State Pension, will give them a secure income of £20k. To achieve this, the Miggins will have to part with £250k of their pension savings. Stuff happens in life, and Tony recommends they need to keep at least £50k for emergencies. This means that the trip of a lifetime they speak of is probably off the table. If they do insist on taking the trip, then their income would reduce to £5,525 a year (purchased using £225,000 of the pension pot after tax free cash). He mentioned that they might expect slightly more income than this, but they won't know for sure until the annuity provider has completed detailed underwriting. Tony did say that they can consider downsizing or borrowing to release equity from their home to fund the trip, holidays and other discretionary spending. But with the annuity he recommends, they’ll never run out of money. They’ll always feel secure. If they ever deplete the £50k slush fund, they won’t have a huge amount of flexibility, or be able to go on holiday, or give money to the grandkids without downsizing their property. But the annuity will ALWAYS make them FEEL secure, apparently. The Miggins thank Tony and asked for a few days to consider his advice. They wanted a second opinion. So, they spoke to financial adviser Jenny King. After conducting a fact find, risk profile and having extensive discussions about their objectives, Jenny recommended a drawdown plan for the Miggins. She recommends they take set aside the £75k; £25k would fund their dream holiday and the rest would be a slush fund. The remaining £225k would be invested in a well-diversified portfolio with 60% Global Equities and 30% Global Bonds and 10% Cash. From this, the Miggins can draw £6,500 a year before tax. This amount is also net of the total advice and investment fees of 1.8%pa. Jenny explains that the withdrawal rate she's recommended is under 3%. Since the future is unknown, Jenny did her analysis using 100 years of historical data that reflects the underlying behaviour of the portfolio she recommends. Her analysis involves testing how her recommendation would have fared in all the 828 monthly rolling 35-year periods between Jan 1915 and Dec., 2018. And she intends to revisit this analysis at least once a year during ongoing meetings with the Miggins. Jenny said that based on this data, the recommended withdrawal amount would last until Jane Miggins's 97th birthday in the historical worst case scenario. The money would last until Jo's 99th birthday in 99% of historical scenarios. Provided the Miggins stay invested, this strategy would have survived extreme market conditions such as WW1, WW2, the Great Depression of 1926 (when the US stock market declined by 79% in real terms), the Oil Crisis of the 70s (when the U.K. stock market declined by 73% in real terms) and several other recessions in the past century. Of course, things could turn out to be worse than all these, in which case, the Miggins could fall back on their property as a last resort in an extreme scenario. But the reality is that such grave scenarios would be also be accompanied by a fundamental failure of the economy and all bets are off. She’s built a robust plan specifically designed to survive severe market conditions but she can’t offer iron-cast guarantees. Jenny explained to the Miggins that while she's based their plan on the historical worst case scenario, she doesn't actually expect future market conditions to be that bad. This means, if market conditions are better than this historical worst case scenario, they'll be able to spend more from the portfolio. For instance, in the median (50th percentile) scenario, they'll be able to spend quite a bit more on the grandkids or end up with a legacy of around £140k in real terms. Jenny explains that the weight of historical data is all she had to reassure the Miggins. She isn't making any predictions about what return would be in the future, or banking on asset managers to deliver any excess return. Furthermore, the option to buy an annuity further down the line, remains on the table. Both Tony and Jenny explained to the Miggins they could combine the two approaches — e.g. 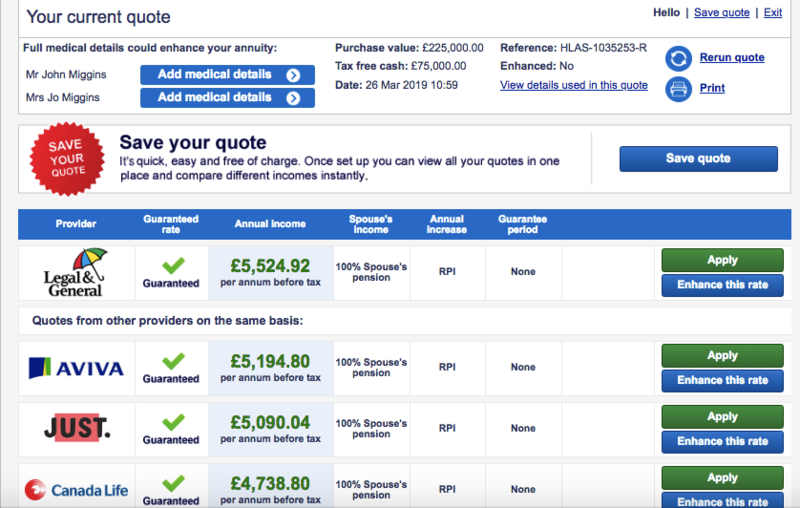 an annuity of £2750 a year with £125,000 of their pot and invest the rest in drawdown. The reality though is that the size of the remaining pot would be too small to justify the significant care and attention required to manage the drawdown properly. The Miggins also recognise that in the event that the drawdown pot runs out, having an annuity income of £230 a month is unlikely to move the needle on their lifestyle one way or the other. Tony is no fan of drawdown as a core source of income. He doesn't really understand or believe in the so-called 'Sustainable Withdrawal' approach and he thinks the peace of mind that comes from never having to worry about the stock market more than justifies the high cost of an annuity. The peace of mind trumps the desire for flexibility, trip of a lifetime and occasional treats for the grandkids that the Miggins want. Jenny thinks the rate offered by annuity is so low that if the Miggins were prepared to only draw £5500 a year (adjusted for inflation) from their £225k (an initial withdrawal rate of 2.5%) the chances of running out of money is so low as to be negligible. She is a believer in the capital markets as the bedrock of our economy. She points out that there has been no period in the last 100 years where the globally diversified asset allocation she recommends runs out of money within 35 years with this level of withdrawal. They could also buy an annuity at a later stage — although there's no telling what annuity rates would be then. Jenny notes that there'll be times when investment markets are patchy and their portfolio will go up and down, but she's already accounted for these scenarios in her analysis. Of course, her job is to hold their hands throughout their journey, whatever the scenarios. So, the Miggins have a big decision to make. While they want peace of mind that an annuity offers, the lack of flexibility and the fact that they’ll be parting with most of their retirement savings isn’t appealing. They certainly don’t want to have to borrow on their property or downsize unless they absolutely have to. The flexibility of sustainable withdrawal from drawdown is appealing and Jenny’s robust analysis offers a degree of comfort but they recognise it offers no cast-iron guarantees. What should the Miggins do?